We recently got the chance to review a great book for all women who are going through a divorce. 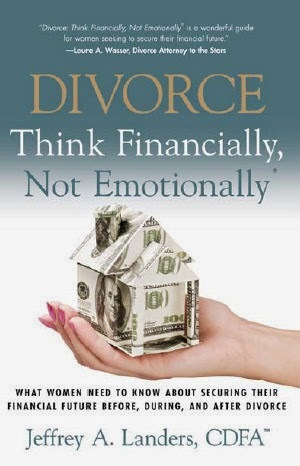 Jeff Landers' new book "Divorce: Think Financially, Not Emotionally" is a must read for any woman who is going through a divorce or even thinking about a divorce. The truth of the matter is divorce happens to lots of couples, and women especially tend to be much more emotional when it comes to divorce, instead of thinking things through sensibly. This book touches on a ton of different subjects relating to divorce and finances, but they are all very easy to understand and Jeff does a great job of explaining things that could otherwise be very complicated. Jeff really does a good job of getting down to the nitty gritty and discussing things that don't usually come up in daily conversation. I would hate that any woman would have a NEED for this book, but the reality is that many women DO need this book. If you are in a situation where divorce is happening or even a possibility, you should give it a read so that you can be prepared and know what to do. The fact is that divorce is messy, and no matter how "smart" you are, or how "financially savvy" you are, things are just different when it's your emotions that are wrapped up in it. You have to keep your wits about you and keep the emotional side out of it (as much as possible, anyway). This book does a great job of helping with that and it is a must read for any woman dealing with a divorce. You can check out Jeff Forbes' blog, website, and YouTube channel for even more helpful information on divorce. Don't forget to buy a copy of the book for yourself on Amazon! With the Kindle version under $10 and the Paperback under $15, you really have no excuse not to get a copy!